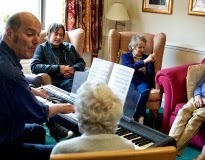 Former bassist from The Verve, Simon Jones, joined residents during a music therapy session at Adlington Manor care home, in Macclesfield earlier this week (7 October). Musician Simon accompanied Nordoff Robbins music therapist Richard Sanderson on one of his weekly visits to the home to find out more about the engaging and beneficial work Nordoff Robbins' music therapists provide. Earlier in the day, Simon also visited Oakdale School in Dukinfield to see how Nordoff Robbins' therapists work with young children aged 3 to 11 with learning disabilities. Richard Sanderson has delivered music therapy sessions at Adlington Manor since 2005, when the Barchester Nordoff Robbins Music Therapy Initiative was set up. As a music therapist he provides one-to-one and group sessions that are important for all residents' general wellbeing, and especially beneficial for those individuals in need of rehabilitation or living with dementia. Today the group experience at Adlington Manor involved ten residents and was based around Richard playing a piano and singing songs. People's connection and taste in music is often unique and is something that defines who they are, giving others an insight into their life and an opportunity to engage with the individual. These music therapy sessions often trigger memories and feelings that are not accessible through other activities. The aim is to evoke feelings of wellbeing, happiness and comfort. Nordoff Robbins music therapist David Robinson, who manages Nordoff Robbins work in the North West and was the therapist during Simon's visit to Oakdale, said: "It was great to welcome Simon to Oakdale School, which has supported music therapy as an intrinsic part of their work with children with special needs for several years. "His visit to Adlington Manor was quite different from his visit to Oakdale School as he got to see how music helps people at the other end of the age spectrum, who face quite different challenges." Simon said: "I had an amazing morning with Nordoff Robbins at Oakdale School, first watching David play piano with Paige who 18 months ago couldn't get out of a wheelchair but now happily stands and plays throughout the session. Then I joined in a session with Dominic who faces extreme difficulties with speech and movement but happily led a blues jam and got us all singing along. The staff are all amazing too - so dedicated. 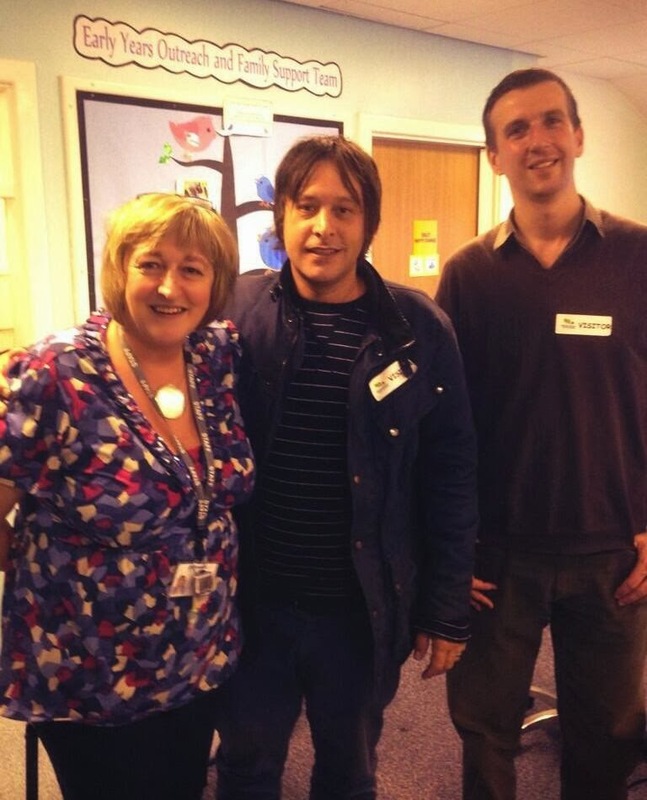 "It was amazing to see the work Nordoff Robbins does with the old and young. After visiting Adlington Manor in Macclesfield today, I was blown away by the therapist Richard Sanderson and how he engaged with the group. They were completely absorbed in music during his session, myself included. His work must have a profound effect in enhancing their lives. Amazing!" Mark McDonald, General Manager at Adlington Manor care home, said:"Music has become key to the wellbeing of all our residents. It has the unique ability to allow the expression of feeling and thought without the use of language. Richard's inspirational therapy is invaluable and has struck a chord with many residents taking part. After receiving national acknowledgement on the BBC1 documentary series 'Imagine', Richard has shown that he has a unique talent. The visit from Simon today will continue to raise the awareness of music therapy in a care home setting and the positive impact Richard has on each resident he works with."